the broad perspective but consciously chooses narrow politics. The reasons become easier to understand as one delves deeper into his personality. 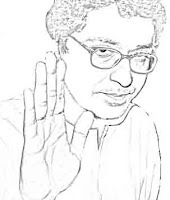 Raj Thackeray has well developed mounts of Venus, Jupiter, Mercury, Mars and Moon. The high development of these mounts show him to be an emotional and fairly volatile person. These emotions have depth, as shown by his widely sweeping Heartline which ends on the Mount of Jupiter and the distance between it and the base of the fingers. Such Heartlines show people who are sentimental and idealistic, and also have compassion for the underdog. His Jupiter finger enhances the quality of idealism. Such people believe in a cause, and possess strong ambition to lead such a cause. The shape of the finger, thumb and Headline shows that the cause is not a religious or esoteric one, but a practical one concerning the reality around him. Check out a hand photograph of his here. 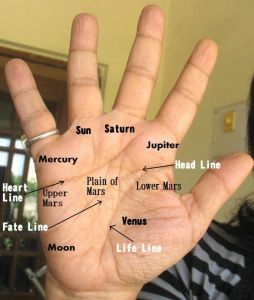 In addition, width and height of Raj's Venus coupled with the position of his thumb emphasizes the qualities of compassion and love for people. His hands also show charisma. When combined with his formidable oratory, shrewdness and the ability to understand people (exceptionally long first phalange of Mercury with a good Mount of Mercury and long finger) such people have the power to sway and influence others to a high, even dangerous degree. I say dangerous because Raj feels very strongly himself, and therefore it is easy for him to inject emotion and passion in his speech. The catch is that his love does not extend to all humanity (Heartline). His other drawbacks are that he is not as open as he should be for a leader, and is also cautious, lacking independent and original thinking and is at times hesitant (start of Headline, position of fingers and thumb). He also tends to be changeable and moody (strong Moon and Headline). These are all restricting qualities that damage his leadership ability. A true political leader has to be able to think for himself, be able to infuse fresh and original thought into his party and also be more stable emotionally. Raj also enjoys attention and wants renown (Sun finger). He will not like to be relegated to the background. 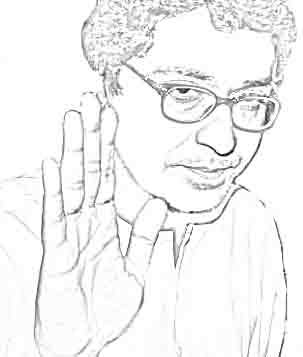 Raj Thackeray's thumb, long and well set, shows self-control, executive and leadership ability and tells us that he is a strong, determined person who is wants to be known for changing society. His purpose is not a selfish one, and money is certainly not what he is after. He is also capable and talented. However the thumb phalanges show that he can be willful and pushy, and can become a bully at times. He gets away with it because of his basic generosity with his flock, willingness to go out of his way to help them and sensitiveness to their needs. Raj's personality is such that he could perhaps fit into another ideology, not necessarily right-wing politics. However he needs a strong cause. He cannot function without a cause, a cause that arouses his anger and his emotions. That is one of the reasons why being a right-winger sits easily with him. Overall, he is well-suited to politics as he can easily garner the love of people and control them. Health-wise his hand shows intestinal difficulties. Related Reading: Bal Thackeray's hands tell us about his character or check out the hand readings of some chief ministers of Indian states like Akhilesh Yadav, Mamata Bannerjee or Mayawati. Or just check out the label Politicians for the hand analysis of other politicians from India and abroad. Well, I agree with you on one thing, he's dangerous alright! interesting. He also seems to have respect from people..and well he does talk well. What he needs is a good set of advisers who will give him the independent thinking etc that he needs. Does he have the sense to do that and can he listen? Vishesh, yeah I guess he has a large following and it's because of his magnetism. Anil, Unfortunately he is not particularly amenable to listening. He is rather bull-headed. However this does not mean he does not listen at all. Just that he needs time. But then I am not sure any of his advisors have too much merit, from my observations. I thought people fake a cause to instigate and control the masses... He himself needs a strong cause came as a surprise to me! Is this the case of a leader believing in his own cause and making people believe in it as well? If so, its quite a rarity, esp. for the current Indian politicians!! I guess it's easier to make people believe if one believes in it oneself. But yeah, a lot of politicians do fake, manipulate and use their money power. i have a smilar heart line, are such people hardworking towards achieving their dreams.? Mr. Curious, the heartline does not show any career indications. It shows one's attitude to others as well as loved ones. well, how will be such persons attitude.? Mr. Curious, I am not sure what you mean. When I talked of Raj T's heartline I was referring to the length of this heartline, the place where it begins and the strength of the beginning and also the relative strength of his heartline to his other lines. The way it is on his hand, it shows an attachment to family. I have also taken into account the width and height of the Mount of Venus on the hand to confirm the conclusion. As mentioned elsewhere on this website, just one sign does not give an accurate indication as other signs could contradict it. Thus, there is no way I can comment on your heartline. where did you got his line patterns .. did you meet him ? I have not met any of the people whose hands I have analysed on this blog. I read hands from photos. hey nita could u tell me about how much importance thumb has in determining ones personality ? and what are phalanges and how do they affetc the bearer??? The thumb is the most important of all the fingers in determining personality. Think of the shape of the hand (fingers and palm) as the framework of the personality and the lines fill in all the little details. The phalanges are demarcated on the inside of the fingers by short lines and thus we have 3 phalanges on each finger. They are critical in personality analysis because the phalanges tell you which world you move in. The mental, the material or the physical. But remember the mounts have to be taken into consideration too, and also the lines to some extent. In addition each finger tells its own story as a long second phalange on the middle finger means something different from a long middle phalange on the index finger. We can either have a fair balance in the length of the three phalanges, or one phalange can dominate. The reading of the phalanges has to be done by noting which mounts are dominant because mount development can alleviate the deficiency of a phalange or it can enhance the importance of one.